The Honorable Elijah Muhammad pointed to all of the nations on the Earth: There’s great anger among them; but the anger to be feared is The Wrath of God. And His Wrath is now in the world because Justice is in His Hand, but it is a Weapon that He is using against the wicked. “As thou hast done, so shall it be done unto you ...” so no matter where you go on the Earth, the people are upset, the people are rising; the awakening of the masses is throwing that supremacy class into confusion because they can’t control the masses anymore. 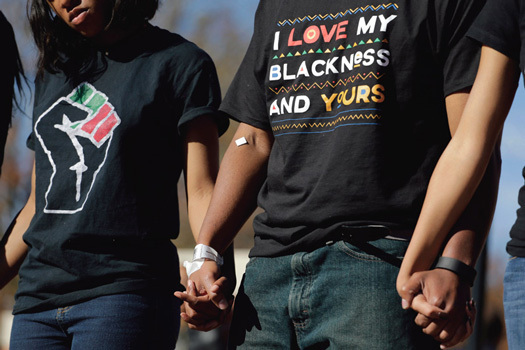 College students across the country united for justice. And while I’m on that subject: Thank you to the students of the University in Missouri, in Columbia. Thank you for demonstrating to our people the power of unity, standing together on that campus for change. You were brilliant. I marveled at the young man who spoke of the plans for the future. ... Even though the president had resigned and the chancellor had resigned, [the students] said, “This is just the beginning! We want ... ”—and he listed several things. The Cry for Justice doesn’t end with somebody retiring, or somebody exiting the scene, because when they exit the scene, injustice is still there. I hope that the new Black president will not be an “Uncle Tom” that the enemy has placed their thinking; that a “Tom” will quell our desire for justice. To my dear brother who is the new president: Stand up for the students—all of them! Stand up for their grievances, all of them! Fight those things that disturb the peace of the students, and you will be a great president, and set a great example for university presidents across this nation. As Ferguson was the epicenter of a Movement, the University of Missouri-at-Columbia is also the epicenter of the Movement of Students now rising, and using the power of our ability that is making all these colleges rich because of our great talent. But the moment the Black football players said, “No, no—we will not practice! We will not play a game until what we seek is carried out,” it didn’t take long—because they saw $35 million at a loss. So it seems like spreading that kind of pain, where dollars are taken from the pool of White Supremacy, then all of a sudden our dollars matter; and then they can consider our lives, and what matters to make our lives better. To Brother Jonathan Butler: You demonstrated that selflessness, and that love for your people, that you would suffer hunger even to the point of death to bring about a change. My dear brother, that spirit is what encouraged the football team. And until we are ready to make the ultimate sacrifice to bring about a change for our generation, and generations yet unborn, this is the spirit that all of us should beg God to give us, the spirit of our brother Jonathan Butler. I will carry you in my heart for what you did. 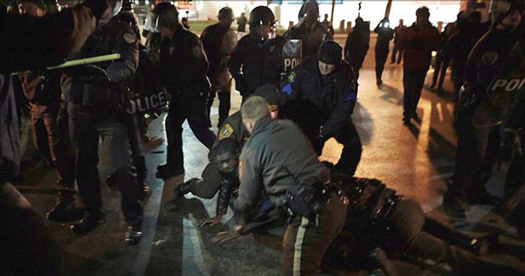 Four policemen subdue a protester in Ferguson, Mo. The killing of Michael Brown, an unarmed teenager who got into a jay-walking dispute with a White police officer, sparked a unified outrage over the treatment of Blacks in America, especially young Black males. So all these “holidays” that have been introduced to us by our former slave masters and their children, they have a purpose: It let the slaves off for a day (which they really appreciated); and then, they had games and competitions between the slaves, and then they allowed the slaves to take a drink, and they would give prizes out to the slave that drank the most and didn’t show signs of drunkenness. And isn’t that the way we behave today? Our days off, which [are] called their “holidays,” give us a day; and of course, the liquor stores are always busy on that day, because that’s the culture of the observance of American holiday seasons. The greatest of these holiday seasons is winter holidays. 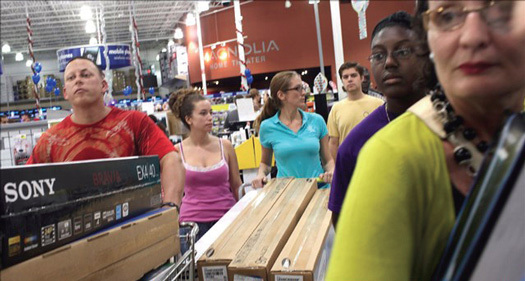 Black Friday 2014 shoppers with flat screen TVs. The Native people are angry that we would dare celebrate “Thanksgiving” when Christopher Columbus sat down with the Native people and had dinner—no! The Native people were the “turkey” on the table for those folk! The Native Americans are angry; the Western Hemisphere is upset, because before Columbus came there were 112-120 million Indians in the Western Hemisphere, particularly in North America, and when Master Fard Muhammad came to us, that number had come all the way down from 112-120 million down to 2 million. So we don’t celebrate Columbus and we don’t celebrate Thanksgiving. Of course we give thanks, but we ought to keep our money, this Thanksgiving, in our pocket. If you can afford a turkey, fine—but the purpose for this should not be “thanksgiving” like the early Pilgrims celebrated it; our “thanksgiving” should be every day that we are alive, and in the company of our families. Don’t spend your money up on Thanksgiving! And the day after, isn’t that what is called “Black Friday”? I would like to see “Black Friday” absent of Black and Brown people. Can you imagine on “Black Fridays” in the past when we’ve rushed to the big stores, and you would watch them watching us: I want them to watch for us; that we won’t be there. On “Black Friday,” “Black Saturday,” “Black Sunday,” all the way to the New Year, put your money in your pocket. If you notice, when the football players were about to deprive that university of the million or so dollars on that Saturday (Nov. 7th): Immediately, what they wanted they got. Martin Luther King said, “Look, you don’t have to run around talking bad; you don’t have to gather any Molotov cocktails and burn up your own community!” Elijah Muhammad said, “You don’t even have to fire one shot—all you have to do is fire the cannon of our unity.” And that’s what brought us to the table, and that’s what gave us a little measure of justice. Now suppose we withheld our money during November and December? That’s easy to do: Just keep your money in your pocket. And if you keep your money in your pocket, that’s money that you will have saved. Imagine if we save hundreds of millions of dollars during that time, we will have money to spend and money to invest in creating a future for ourselves. Did you know that if we just spent one-tenth of 1 percent of what we spend for these holidays with Black businesses, they would be able to hire thousands of Black people, giving them jobs? Imagine if we knew how to invest the money that we would save; we could be free, justified and equal, building our own economic base. Let’s look again at this “Christmas”: Did you know that in 1962, Medgar Evers—(some of you young ones have not heard of him, but look him up; he is a great brother from the NAACP in Jackson, Mississippi)—decided, because of the ill-treatment of the Blacks in Mississippi, particularly in the city of Jackson, that they would not support those big businesses in Jackson, Mississippi with Black dollars. The boycott that he did was 99 percent successful; so successful, that the mayor had to come out and literally beg Black people, “Spend money! We’ll protect you! We’ll give you police protection from the boycotters!” Not today! We don’t need protection—we’re not going to show up. We intend to make our unity felt in America. Brothers and sisters, “Santa Claus” is a lie. 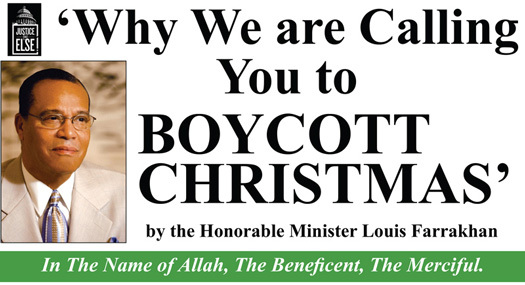 The great Adam Clayton Powell told us, “Boycott Christmas! Santa Claus is a lie!” You who are Christians, you read the Book of John where Jesus said, “I am The Way, The Truth, and The Life”: If Jesus is The Truth, why would you lie to your children on his birthday, telling a lie that a big fat Caucasian came down a chimney that you don’t have, with his eight reindeer, and gave you something that your parents went out and sacrificed (and went into debt, by the way, for another year) to give you a puzzle or a doll, or a little pistol, or whatever your heart’s desire? You’ll get your “toys,” but not now; not November, not December. We’ll find a Black store that’s selling things that have meaning. Most of the gifts that you give on Christmas really have no meaning. The best gift you could give on Christmas is you: Your heart, your love, for your family and your friends. Let’s make this Christmas a Christmas where Christ is back in the center of what we believe is his birth date. And now you know the slave master let the slaves get drunk; the slave master put it in the “holidays,” and every single holiday, particularly Christmas, the liquor stores get our money: Let’s rid our selves of the lust of wine and strong drink. Let’s keep that money in our pocket. And you know, when they look up and they don’t see you at the liquor store, they will know that the boycott is successful (“Black folk are rising, and we feel their power!”). Then whatever demands we put on the table—because this boycott is just the beginning, [then] of course, don’t be afraid: Their loss of money makes them desperate, and of course they’re going to want to do something about it. Now, the Honorable Elijah Muhammad said to me, “Brother, I can’t promise that we won’t get a hickie”—not on your neck, but on your head (smile)—“I can’t promise you that some of us won’t go to jail. I can’t promise you that some of us won’t even lose our lives in this quest for justice,” but he said, “I can promise you victory.” And “victory” means that what we seek we shall find; what we ask for we will get, and any door that we knock on, as a unified body, that door will open. And that heart, even if they don’t feel it: The loss of their economic strength will cause the door to open. It’s time now. Did you know that in the Book of John, the thing that caused Jesus to be murdered, betrayed and lied on was he got angry, and in his anger, he took a cord and he twisted [those] cords together, into a whip, and he went in and drove the money changers out of the temple and turned their tables over. This is Jesus, angry, whipping the money changers. Well who were the “money changers” in that day? And who are the “money changers” today? Elijah Muhammad said, quote: “If one well-twisted cord is hard to break, what about 100 cords twisted together? Impossible to break.” And that is the power of our unity. May Allah bless us to be unified in mind and spirit; may we find joy in keeping our money in our pockets. Man, just think about the discipline that you will impose on yourself. Did you see on television? All kinds of sales are being offered. Oh man, Christmas is coming early this year. ... They started playing all the Christmas music, Rudolph The Red-Nosed Reindeer—“Santa” is big, man. I even saw this morning on television a Black-faced “Santa.” (If you see one, tell him: “Come on, brother, get up out of that foolish uniform! The ‘uniform’ that you got is what is catching hell, and that’s your Black face.”) We can’t take that off; we are suffering because we are Black. And we are suffering more because of the lack of knowledge. Now let me close this with these holidays that are based on paganism: Did you know that when you put your lights on, put it all over your house, put a candle in the window, and a wreath, that’s because the people worshiped the Sun? And next month, December the 21st is the shortest day of the year, so the Sun worshippers thought their god was leaving them; so they were entreating their god to come back to them, so they would burn a yule log, they lit candles; they cut the tree out of the forest—yes! And when Constantine became a “Christian” from being a pagan, he substituted the worship of The Sun for the worship of The Son of God. But how do you carry out the honor and worship of Christ? Drunk? That’s part of the holiday season. Foolish? Doing unrighteous things? We have dishonored Jesus by the way we practice pagan/heathen practices as ex-slaves in the manner that we were acculturated to act. Did you know that the money that we get out of our economy, $1.1 trillion to $1.3 trillion, we spend it almost as fast as we get it? I was shocked when I heard some statistics; that: The Asian people, Chinatown, Koreatown: Their money circulates in their community nearly a whole month before it goes. The Jewish people: Their money circulates in their community for 20-some days before it leaves. Even our Mexican family: They are better than we, in turning their money around in their own community. But when I heard that our money leaves in six hours: Where did that come from? Did you know that under Abraham Lincoln, he established “The Freedman’s Bank”; and Black people coming out of slavery put over $5 million in several of the Freedman’s Banks, and through a scheme they closed the banks down and all our money was lost? This crippled in us a desire to save. And most of us have not saved anything; as fast as we get the money, we spend it. Did you know that when we were sharecropping: If we saved our money and put it in a mattress, the slave master could come, go in our house, or a little place where we lived, and take our money? If we hid it in a bale of cotton, they would search, and if they found it they’d take it. It’s part of “The Slave Code” (“A Black man must never save money!” “A Black man must never invest money!” “A Black man must never think about economic development!”) So as fast as you get your money, you run away to spend it, because we learned during slavery that’s the only way we could keep the power of our money; because the slave master would take it if we saved it, so we went right out and spent it. And now it’s part of our culture: $1.1 trillion to $1.3 trillion, and it’s gone; fast as we get it, we spend it. So we’ll be breaking some bad habits this Christmas, with your help: We’ll be getting a “step up” on economic development for our people starting with this boycott. And all you’re doing is squeezing your money in your pocket. Just squeeze it. ... Don’t throw it away. Don’t give it away. Find a Black business that is selling things, and spend some of your money with them. Elijah Muhammad hated these big retail stores. You know why? They come into our community; they buy in bulk, and they can lower the price, and they put all little Black businesses out of business. We should say, “To hell with them!” Find a Black store that you can support! Find a Brown store that you can support! And this Christmas, after we get to the New Year by God’s Grace, we’ll get ready to get on to The Second Phase of Our Work! [This Movement] can’t stop until justice flows down the mountain like a river, and righteousness like a mighty stream. You’ll be the “Or Else!”... God is the big “Or Else!”—but you and I can be a little “or else.” Remember the words of Dr. King when he said (in his April 3, 1968 speech “I’ve Been To The Mountaintop”): “Go by the business stores and tell them, ‘God sent me by here to say to you: You are not treating His people right’”—these are Dr. King’s words!—“God said He wants you to treat His people fair; that should be first on your agenda.” He said, “But if you don’t do that, in our agenda we will withdraw our support economically from you.” We’re going to do that until The Black Life, The Cause of Justice, is honored and respected. May Allah bless you. There’ll be more messages like this coming to you, [but] parse these words; sit around a table and discuss it. Get your Bible, and look at it. And if the enemy is so angry with me and us for calling this boycott: Then don’t bother my people, come to me—I’m talking to the enemy—I’m waiting on you. My God has something for you; if you think that you can put over what you’ve been doing to my brothers before me, try it, and God will be quick to show you. Dr. King is probably the last great Black leader that you will kill. Stand up, Black People! Stand up, Brown People! Stand up, Indigenous People! Keep your money, and let’s show the world our unity—and watch them bow. Thank you for reading these words, and may Allah bless you with the Light of Understanding, as I greet you in peace: As-Salaam Alaikum.